MAMARONECK—The first major residential rental development in the Village of Mamaroneck in 20 years broke ground recently. 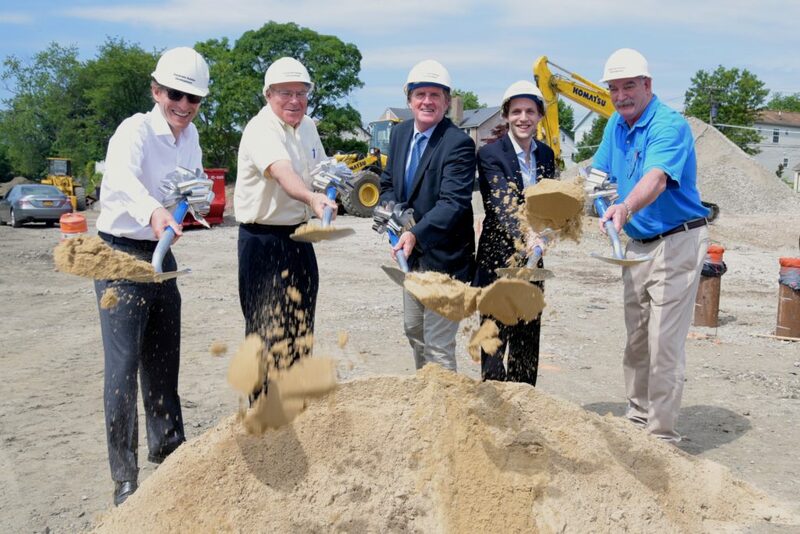 Village and county officials joined developer Halpern Real Estate Ventures and its partner, The Rosen Development Group, at a groundbreaking ceremony on June 15th for a loft-style development featuring luxury rental apartments and townhouses on a downtown site near the Mamaroneck Metro-North station. The 270 Waverly Ave. site sits on 2.7-acres across the street from the Mamaroneck Metro-North station. Designed by Papp Architects of White Plains, the project will feature 100 rental homes in four adjacent buildings designed to incorporate the industrial and downtown aesthetic of the surrounding area. The sponsor has extensive experience developing in New York City, having just completed one of Lower Manhattan’s most successful boutique rental developments in the Lower East Side. Leveraging the success of its prior development, the sponsor is working again with Manhattan based architecture firm Stephen B. Jacobs Architecture to design the project’s interiors. The development includes five affordable apartments as well as a separate building with four two-bedroom townhouses. The buildings are expected to open in the fall of 2018. The apartments offer a mix of seven studios, 45 one-bedroom, and 44 two-bedroom homes, as well as four townhomes. The four, two-bedroom, 2.5 bathroom, 1,500-square-foot townhouses will each have two-car garages, and will offer access to the development’s extensive amenities. The $35-million project will feature a brick and zinc clad façade with expansive floor-to-ceiling steel casement windows. The units have a “loft-like” design and offer high quality, condo level finishes, including; hardwood flooring throughout, extensive tile packages, high quality kitchen cabinets, quartz countertops, and stainless-steel appliances. In addition, every home will feature a washer and dryer, and 44 homes will provide outdoor space; 10 of which will include a large penthouse level terrace. The “loft-like” feel and design of the development will differentiate the project from other more traditional garden-style developments in Westchester, Halpern officials stated. Tenant amenities include a full gym, resident lounge and an outdoor deck with a grilling area, fire-pits and an outdoor screening area. The complex will incorporate green technology features including electric vehicle chargers in the garages and solar panels to provide power to the common areas. The project will also offer 132 parking spaces. “We are thrilled to be returning to Westchester, where for more than seven decades our family has developed, owned and managed both urban and suburban office buildings and built high-quality residential developments,” said Project Director Joel Halpern, who represents the fifth generation of his family in the development business. Joel is a partner with his father, Jon, who headed the family’s real estate operations in Westchester from the late 1980s through early 2000s. His grandfather, the late Joel Halpern, was a prominent commercial developer in the 1970s creating the Tarrytown Corporate Center, a seven-building office park on Route 119 in Tarrytown that includes the Westchester Marriott Hotel. The complex is currently owned by RXR Realty. His great grandfather, Harry, developed hundreds of residential apartments in the Bronx and lower Westchester in the 1950s and 1960s. Based in Manhattan, Halpern Real Estate Ventures is a developer in several major residential developments in lower Manhattan including the Renzo Piano designed 565 Broome St., the Jones on the Lower East Side, as well as several developments in Brooklyn. The Rosen Development Group, a third generation builder and developer based in Harrison, is very familiar with the Westchester residential market, and is one of the most active developers in Mamaroneck. The company is currently building Phillips Harbor, a development of seven luxury condominium homes in Mamaroneck across the street from Harbor Island Park. Other projects developed by the company in Westchester include Country Sound Homes in Rye, The Springs at Purchase in Purchase, Chelsea Parc in the Town of Greenburgh and The Wimbledon in White Plains. Last fall, the project received unanimous approval from the County of Westchester Industrial Development Agency for financial incentives. AMEC LLC of Norwalk is the general contractor. AMEC currently has other multi-family projects under construction in Westchester and Fairfield counties including a 105-unit apartment building in Elmsford and an 85-unit apartment building in New Rochelle. AMEC is a family owned company headed by its President, Guy Mazzola. Marketing and leasing will be performed by The Marketing Directors.